Did your package get delivered to a neighbour, or not at all? Is it completely lost? You're not alone! It's hard to receive packages in Germany. Even when you are home all day, your packages are often delivered to neighbours, nearby shops, or Paketshops1. I had to retrieve some packages in shops 3 kilometres from home. I also became an unofficial DHL Paketshop when the driver found that I work from home. It doesn't matter if you use DHL, Hermes, GLS, Amazon Logistics or any other service. They are all pretty bad. Why are German delivery services so bad? Your package won't always be delivered at your door, even if you are waiting at home. The driver will not always ring your doorbell before leaving the package somewhere else. Use the tracking number to find which neighbour has your package. Sometimes, they won't give you that information. You will have to find the package yourself! If you don't pick up your package, it will be returned to the sender after a few days. If you just got a delivery slip, wait until the next day. Your package will be returned to the post office at the end of the day. You won't always get a delivery slip. Sometimes, you won't get any notification when your package arrives. You must use the tracking number to find your package. It's the most reliable way. I use paketda.de to track my packages. Delivery drivers have too much work, and are not paid enough. The drivers must deliver hundreds of packages every day for a very low salary1. They save time however they can. This is why they don't ring your doorbell, deliver your packages to neighbours and forget to leave delivery slips. If you want to receive your packages reliably, don't use your home address. You can send your packages directly to pickup locations in your neighbourhood. This service is free. That includes Amazon Lockers, DHL Packstations, Hermes PaketShops and DPD Pickup locations. Your packages arrive where you want them to, and you don't need to wait at home. If the Packstation is full, they will deliver your package to another Packstation. You must sign up for DHL Packstations before you can use them. Sometimes, it's easier to get things from the store yourself. Some people say that befriending your delivery driver helps1, 2. They give a better service if you tip them or offer them a drink. 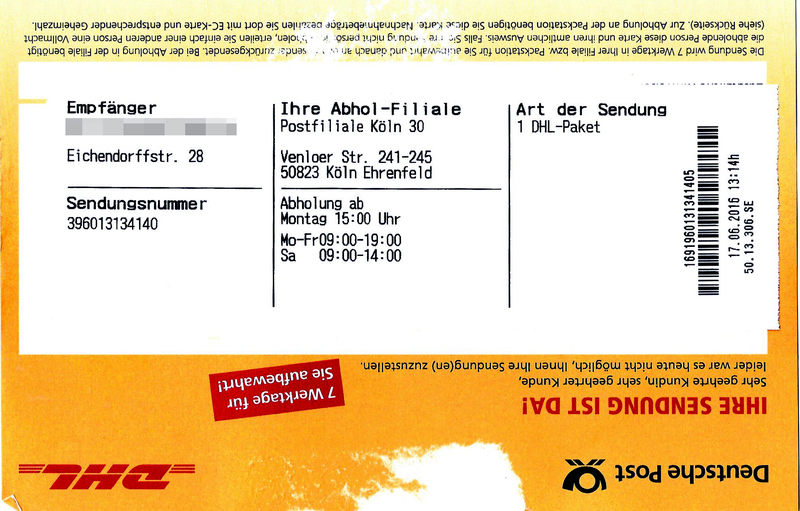 This is how you address letters and packages when you live in Germany.